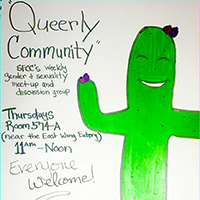 Queerly Community is SFCC's new weekly gender & sexuality meet-up and discussion group. The group meets from 11 a.m. to noon on Thursdays beginning on Jan. 24 The group meets in Room 214. Come kick it and get to know and build community! All are welcome. For more info, please email <a href="mailto:emily.stern@sfcc.edu">emily.stern@sfcc.edu</a> or call 505-428-1467.